Coffee With Games: Want Your Own Pikmin Pet? Buy Your Own. Want Your Own Pikmin Pet? Buy Your Own. Nintendo debuted Pikmin 3 at E3 this year giving it the first spotlight and coverage for their conference. 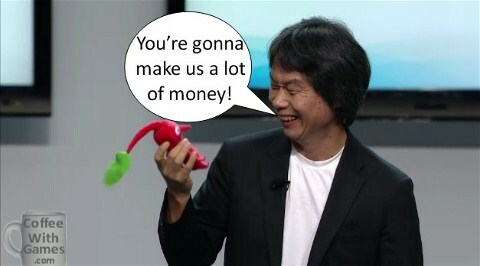 As you can see in the image above, Mr. Miyamoto not only debuted the digital versions of the new Pikmin, but also came out with a stuffed red Pikmin "hiding" in his pocket. When I saw him on stage with it, I actually thought, "Hmm, I wonder if those stuffed Pikmin toys are available to purchase? ", so I did a search. From my search online, only one major retailer carries Pikmin plush toys that I have found, and the selection available varies a good bit. Wal-Mart, Target, and Toys R' US did not have any stuffed Pikmin toys on their sites, and only listed the Nintendo Selects: Pikmin 2 game that will be releasing this Sunday when I searched "Pikmin". Perhaps those retailers have them available in their stores? If you know they do, a comment verifying that would be great! 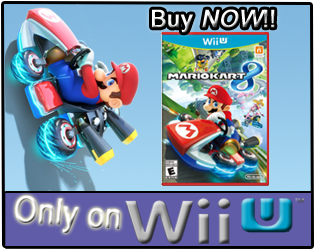 If you're not aware, both GameStop and Amazon.com are now taking pre-orders/reservations on some of the Wii U games, and you can reserve Pikmin 3 on both below. 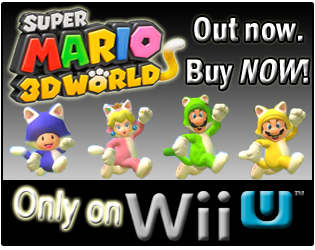 Also, you can see the Nintendo Selects: Pikmin 2 below as well, and it will be releasing this Sunday on the Wii. I believe you can also buy Pikmin plushies at the Nintendo World Store in NYC. nice image. reminds me of the DS image with the caption like: It prints money! 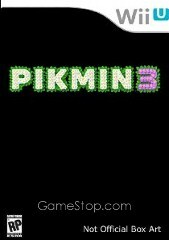 I actually have never played any of the Pikman games, so I wasn't as excited by that particular announcement as some probably were, but it was a solid demo for that game at least. When I was last there they didn't carry them anymore, but that was before they renovated. These plushies were released years ago, like...2008? Play-Asia used to carry them and I saw them at a few anime conventions back then. "I actually have never played any of the Pikman games..."
Well, the first two can be found on the Wii for around $20 now, and probably less than that in the GameCube bargain bin where-ever that is currently located, AND GameCube games can be played on the Wii. Though, the pointer controls seem to be well done and help the game-play elements in the games, so $20 to help keep Iwata as President of Nintendo, and Reggie as President of NOA, doesn't seem too shabby now...does it? Yea, the plushies seem to be harder to locate in stores, which is why I was glad to see both Amazon.com directly, and third parties on Amazon, offering them up. I have never been to the Nintendo Store, though if I go up to NYC, it's at the TOP of my stops to go to. Unfortunately, the Nintendo Store doesn't allow shopping online. They're 8 bucks in Akihabara. Black Ops 2 Wii U is Happening. May Brewed - Coffees Consumed, Games Played!